St Andrew stands near the boundary between Hove and Brighton and like the houses of Brunswick Town that it served, is built of stuccoed brick. 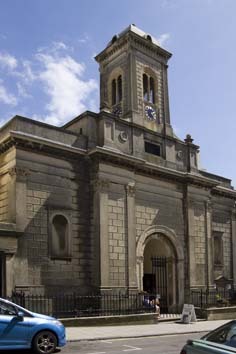 Known initially as Brunswick Chapel, it was designed by Sir C Barry in 1827-28 (A Barry, p355) and is thought to be his earliest work in the Italian style, so it contrasts with his other local church, St Peter, Brighton. As built, it had no chancel, just a tall east recess, flanked by smaller ones (AR 44 p26). It echoed the deeply recessed main entrance, which is flanked by pilasters and forms the centre of the rusticated west front, the only part of the exterior to be given architectural treatment. Instead of windows, there are niches in square-headed surrounds. The substantial belfry has a domed top. 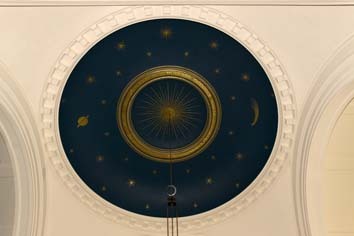 The nave retains a flat, coffered ceiling, though skylights were inserted in 1882 by C Barry junior (B 43 p97), and has a west gallery. Other alterations he made were more substantial. 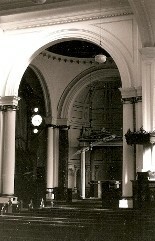 Land was purchased behind the chapel for a chancel, which makes the whole interior more grandiose, for its main part is circular, under a shallow saucer dome, with large round-headed arches each side and freestanding Ionic columns. East of this is a shallow apse. The work was estimated to cost about £2500 (BN 40 p51). 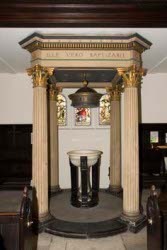 Despite such changes, the church was thought insufficiently Italian in the C20 and in 1925 W H R Blacking (Clarke papers) designed new fittings, mostly in dark wood, (see below), but with some painting and gilding to offset this. The result was attractively eclectic, but changing patterns of population led to redundancy in 1990, after which the church was vested in the Churches Conservation Trust. Altar rails: Blacking, with widely spaced turned balusters, 1925. Only one remains of the eight bronze cherub’s heads that originally served as finials, the others having been stolen after the church became redundant (Watney p54). Baldacchino: (Apse) 1925, with a triangular pediment. Font: 1925, also under a baldacchino, though flat-topped and smaller. The font consists of a white marble bowl on a wooden tripod. 1. (Nave side roundels, four each side) single figures by J Hardman and Co, 1869 (south) and 1883 (north) (ibid). Their style matched the church, but they have been subjected to the deplorable practice of ‘pickling’ and have lost their backgrounds. 2. (West window) J Hardman and Co, 1882 (www.stainedglassrecords.org retrieved on 11/3/2013). 3. (South transept and baptistery) J Hardman and Co, 1883-89. Those behind the font are unusual in having fully coloured figures but brown backgrounds (CDK 1884 pt 2 p143). 4. 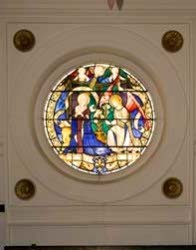 (South east window and roundels) C Webb, 1927 and 1938 (DSGW 1939). 1. Lord Charles Somerset (d1831) by J Ternouth (Roscoe p1231). Allegorical figure. 2. Sir Charles Dallas (d1833) with a similar allegorical figure, also by J Ternouth (ibid). Pulpit: C17 in style with a tester with openwork decoration. My thanks to Nick Wiseman for making the colour photos available.